Clarke Energy, which has been awarded the engineering, procurement and construction contract for the Tennant Creek and Owen Springs power station upgrades, today invited expressions of interest for “multiple work packages” and for “for any opportunities that may arise for this project”. The full scope invitation will close on November 1 and on November 16 for the partial scope. Glenn Marshall, a member of RePower Alice Springs, which is seeking to have the project modified to include renewable energy elements, says the time frame appears to allow for this to occur. The project is worth $100m and will involve 10 gas powered piston engines in Owen Springs, 20 km south of Alice Springs, and three in Tennant Creek. No renewable power elements are included at this point. Says the invitation document: “The upgrade of Tennant Creek Power Station will involve the implementation of three GE Jenbacher 2 megawatt gas fired spark ignition reciprocating engines and a 1.5 MW diesel fired reciprocating engine power station to be located adjacent to the existing plant. “The expansion of Owen Springs Power Station will comprise the construction of a nominal 44 MW gas fired reciprocating engine power station including 10 GE Jenbacher 4.4 megawatt gas fired spark ignition reciprocating engines adjacent to the existing Owen Springs Power Station. 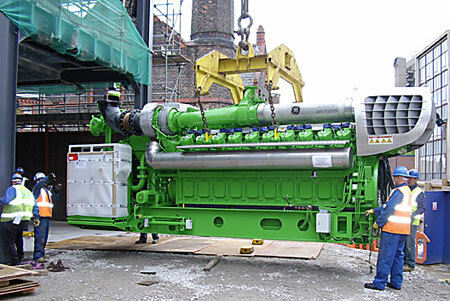 “Clarke Energy is the authorised distributor and service partner for GE Jenbacher gas engines (pictured) and high efficiency diesel fuelled engines in Australia. Hi Fred, The project is listed on ICN Gateway which is available Australia wide. When asking for contractors for this project, have the other tradies in other states been notified? I have not seen any tenders in interstate papers, or is this a job for the boys? If it has been advertised I would like to know what papers. My brother makes diesel from animal fat, runs all the machinery on his farm and his cars with it. It is a simple process and ends up costing him 27 cents/litre.